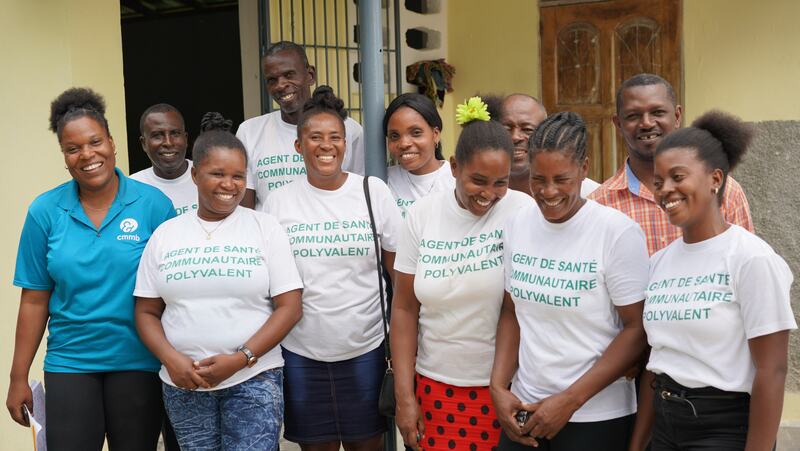 April 1st to 7th is World Health Worker Week— a time to celebrate the incredible people working on the front lines of health in communities and raising awareness of the challenges they face every day. It is also a chance to mobilize resources and support for health workers across the globe. At CMMB, we know that our health workers are at the core of what we do. 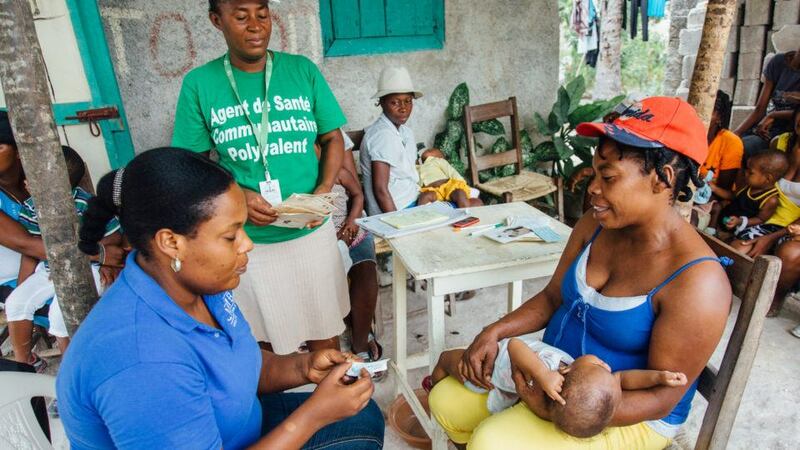 We appreciate their work every day to make health a reality for women, children, and communities living in poverty. This year’s World Health Worker Week theme is: “Health Workers Are the Heart of Health For All.” We kick off the week by introducing one health worker who is truly the heart of her community and in the hearts of all she serves. Côtes-de-Fer, Haiti is a extremely remote and impoverished community in southern Haiti. It’s a place where donkeys and goats outnumber cars on the dirt roads and where the majority of residents live without running water or electricity. It is also the location of CMMB’s Bishop Joseph Sullivan Center for Health, a hospital that opened its doors in 2017. Not everyone loves when the nurse comes to visit! Joanne and a baby during a home visit. Joanne was born and raised in Côtes-de-Fer. When she was just ten years old, her family moved to Port-au-Prince to seek better opportunities and a better life. As a little girl, Joanne was inspired by her aunt who worked as a nurse. She made up her mind that one day, she too, would become a nurse and help sick people get better. This dream motivated her to work hard and to continue her education. Joanne has been working with CMMB as our Children and Mothers Partnerships (CHAMPS) manager in Côtes-de-Fer since 2014. 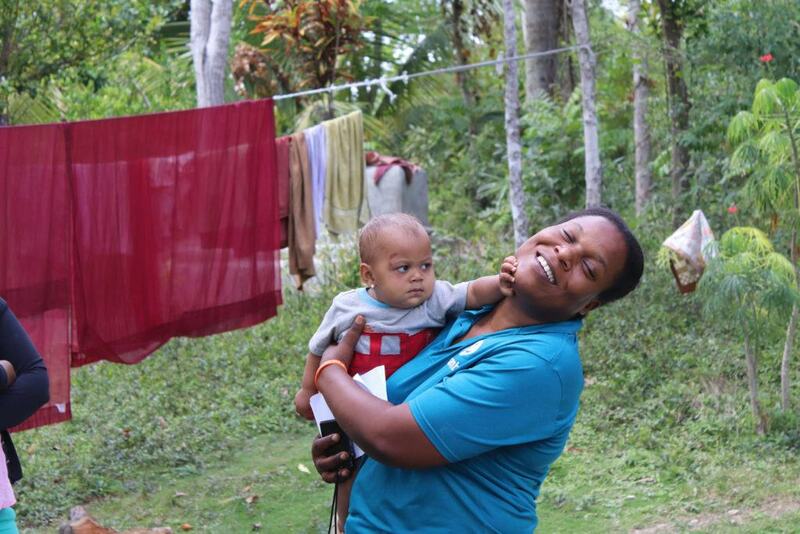 She works at the community level and at the hospital with women and children affected by poverty. Joanne is a VERY busy nurse. She manages our amazing network of community health workers, organizes vaccination and malnutrition clinics, leads Mother’s Clubs that provide health education and tools to mothers in the communities, and she coordinates care for pregnant mothers and newborns, to name just a few! Joanne delivers important health news to mothers during her home visits. Walking around Côtes-de-Fer with Joanne is like walking around with a local celebrity. She is inundated by greetings: “Bonswa Ms Joanne!” “Bonjou Joanne!” “Kijan ou ye, Ms Joanne?” She knows everyone and everyone knows her. The love she has for her community is undeniable. And it’s remarkable – though not surprising – to see just how much her community loves her back. Her commitment to improving their lives means that people are incredibly grateful. I am fascinated by motherhood. I love seeing women give birth to healthy babies. It brings me great joy. Joanne told us that the most inspiring part of her job is working with pregnant mothers. Her work over the past two years has been focused on ensuring women in the community attend their pre-and-postnatal visits and deliver their babies at the hospital. Joanne’s passion for healthy pregnancies, safe births, and women in her community has saved lives. 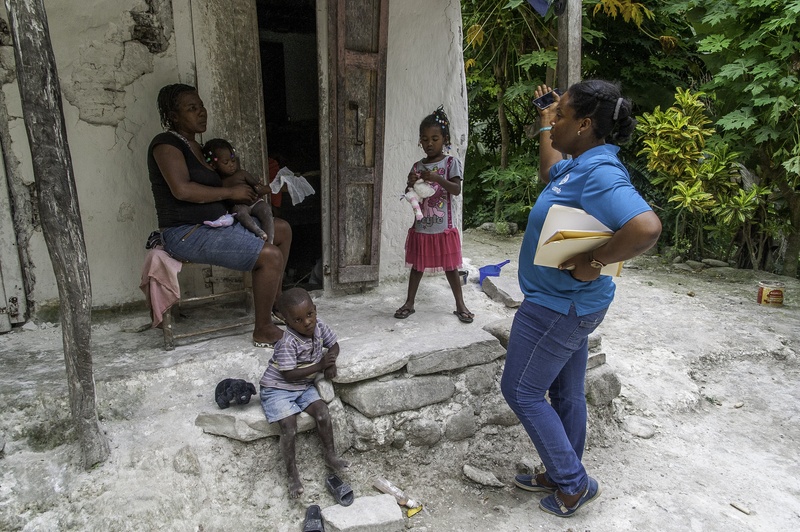 On any given day, Joanne can be found traveling from home visits to the hospital to check on a new mom to the clinic where her team is administering anti-worming medicine to sick children. No day is ever the same. But Joanne said she likes it that way. Health workers, like Joanne, are critical to the communities that they serve. We cannot achieve healthier lives for women and children without them. This week (and every week!) be sure to thank the people in your community who are committed to improving health. There really is no better gift than good health.